Physician to Pope Nicholas IV. or Boniface VIII. at the end of the thirteenth century. For him Nathan of Cento translated into Hebrew an Arabic work by 'Ammar ibn Ali al-Mauṣili on the cure of diseases of the eye. Gajo was held in great esteem by the physicians Zerahiah ben Shealtiel Ḥen and Hillel b. Samuel of Verona. The latter wrote to Gajo two long letters (see "Ḥemdah Genuzah," pp. 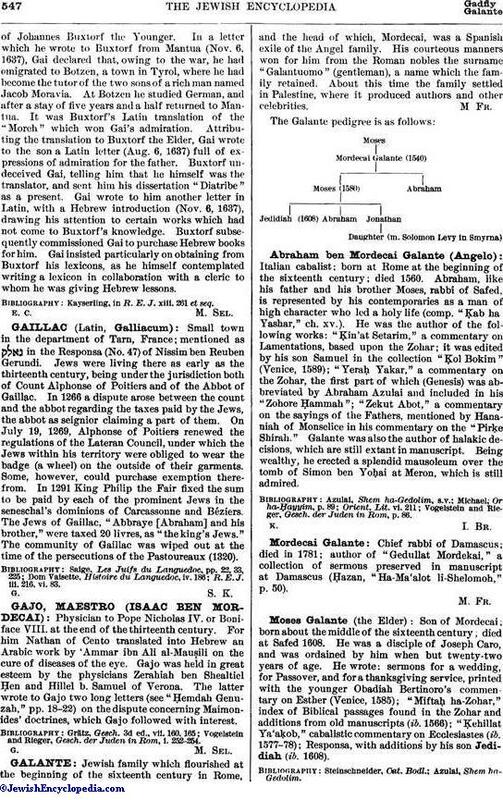 18-22) on the dispute concerning Maimonides' doctrines, which Gajo followed with interest. Vogelstein and Rieger, Gesch. der Juden in Rom, i. 252-254.